I kept Google'ing this until I came to a different solution. I ended up downloading the terminfo directory from somewhere (I forgot where so I just posted the zip on my website here) and replaced my current working terminfo directory with the new stuff. ... and I am still able to keep "xterm-256color". The default is "xterm-color" and I changed it to "xterm-256color". Is there a reason for this to be happening? Any thoughts as to why this might be happening? Let me know if I need to show my .bashrc or .profile. Looks like your TERM value isn't recognized. You are probably setting the TERM value in your .profile (or similar) or you've got missing/corrupt files or invalid permissions in /usr/share/terminfo/. 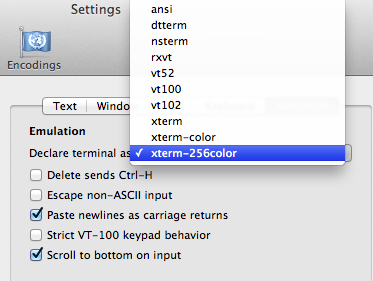 In Mac OS X Lion 1.07, Terminal now supports 256 colors, Background Color Erase (BCE) and some other features that make it more compatible with modern xterm, and the default value for $TERM is now xterm-256color instead of xterm-color (which represents an older branch of xterm with less functionality). The error you're seeing indicates that the appropriate terminfo files for xterm-256color are either missing or inaccessible. You might try installing Lion again. Also, some people have reported that installing Xcode 4 on Lion can cause this problem. This will either display an error or the appropriate terminfo values for xterm-256color, and, if found, it displays the pathname to the terminfo file it used. xterm-256color should be present in /usr/share/terminfo/78. In the past, there were issues with Xcode messing up permissions to a huge degree. Worst case scenario, use disk utility and repair your permissions. You will need to boot from an install DVD and verify/repair your boot partition. I also came across this error on the new Mac. In my case, the error is caused by using "conda create -c rdkit -n rdkit-env rdkit" (source link) to create a conda environment with the rdkit for Python3.7 on Mac. Otherwise, the clear command works fine for the other conda or virtual Python environments. N.B. : I did not try @Christopher Brunner's symbolic link solution which requires sudo, but sudo command is not always available for someone who works with university computer or HPC computers. A general solution is you would need to install py-readline or deadline package for python. Not the answer you're looking for? Browse other questions tagged macos terminal osx-lion or ask your own question. How do I reset the $PATH variable on Mac OS X? How can I add myself to _www:staff permanently on osx?